ToolGuyd > Hand Tools > EDC, Pocket, & Multitools > 2017 Father’s Day Tool Gift Guide! It’s been some time since I did a Father’s Day Gift Guide, here on ToolGuyd or anywhere else. I’ve been meaning to follow up my Ultimate Tool Gift Guide (vol. 2?) with a second general gift guide, but it keeps getting away from me. I don’t know if I was going to do one for this year’s Father’s Day shopping season. I like reading about new stuff to add to my own wishlist and shopping list, but it’s hard to put together suggestions that regular readers might not have recently read about. For a non-tool-focused site? There’s plenty of tool gift guide material. But for users who might be more familiar with newer tools out there? It’s harder to come up with interesting suggestions or recommendations. Hey Stuart how about an article on some Father’s Day gifts in different price ranges. It is always nice to get something not only useful, but something you want. Hmm, that changes things. A direct request for a Father’s Day gift guide. Okay, I’ll take the challenge! For this 2017 Father’s Day gift guide, I pulled some ideas that were fresh at the top of my mind. I tried to keep things varied, and also injected a few ideas of tools you might not have seen before. As of the time of this posting, here are 25 recommendations and suggestions, in no particular order. 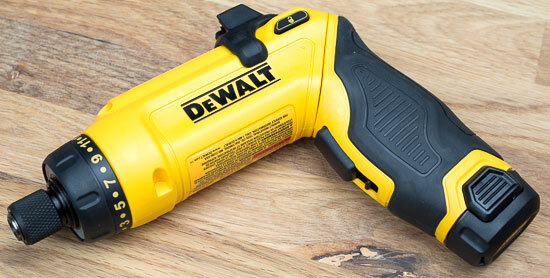 This Dewalt 20V Max brushless drill/driver, DCD777, is the $99 drill kit I’ve been buying as housewarming gifts. 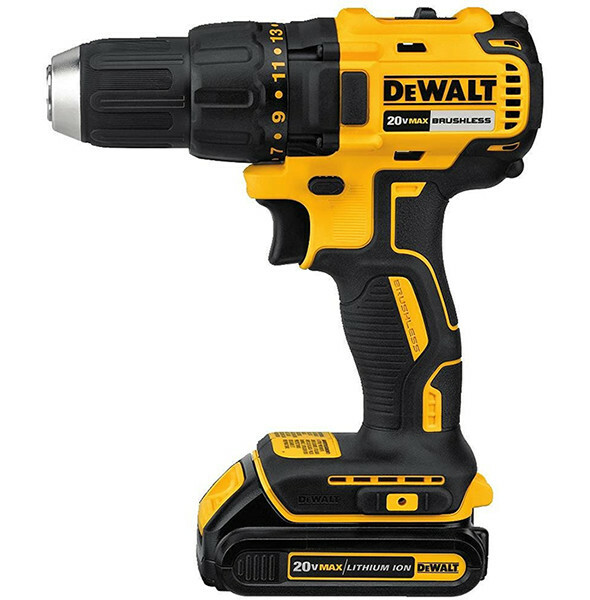 I haven’t tried it – yet – but on paper it looks like a decent compact cordless drill, and it looks to have the same ergonomics as Dewalt’s leading 20V Max tools. This seems to be a lower priced mass-market model, but it’s the most appealing one I’ve come across yet. And the kit comes with (2) Li-ion battery packs. They’re lower capacity packs, but you do get 2 of them. If you caught my review of the Kershaw Dividend pocket knife, you’d know I highly recommend this sub-$40 USA-made folding knife. The Link is its big brother, and there are more blade and handle styles to choose from. I wouldn’t recommend these for older users. My father and father in-law both have trouble with liner locks. I think my dad would get more use out of a fixed-blade Mora knife than any folder. They’re very inexpensive, so it’s a low-risk guess to make. These are good all-around knives that can handle some rough use. I am going to make a guess here, and say that Ryobi 18V One+ users typically have several Li-ion battery packs. With Ryobi offering cordless tools and accessories of all kinds, that’s not so hard to imagine. 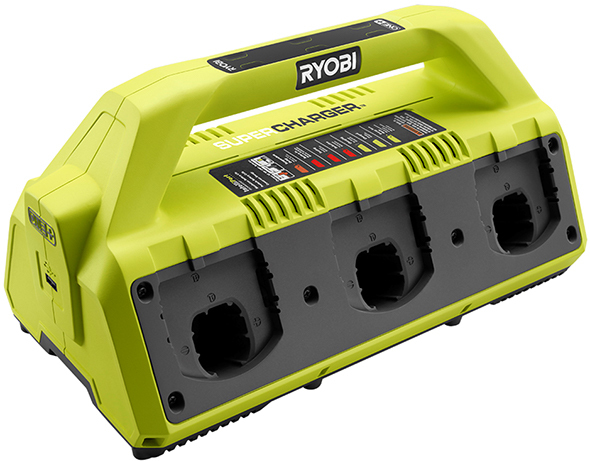 Ryobi’s newest 6-port charger is definitely an improvement over the older one. It’s more compact and more convenient to carry and stow. If I had at least 3-4 Ryobi 18V battery packs, this would definitely be on my wishlist. Admission: I’ll use my test sample for even just 2 batteries. It’s more convenient than pulling 2 separate Ryobi chargers into use. Bonus: It’s got a 2-ampUSB charging port on the side. Fein makes a fantastic oscillating multi-tool. Prior to the new Bosch and Fein joint Starlock interface, I considered my Fein MultiMaster to be the best corded oscillating tool on the market. This new Starlock version is even better. Their starter kit is reasonably priced, but bare on accessories. I have taken a liking to Bosch oscillating multi-tool accessories, and their Starlock blades have come down in price. 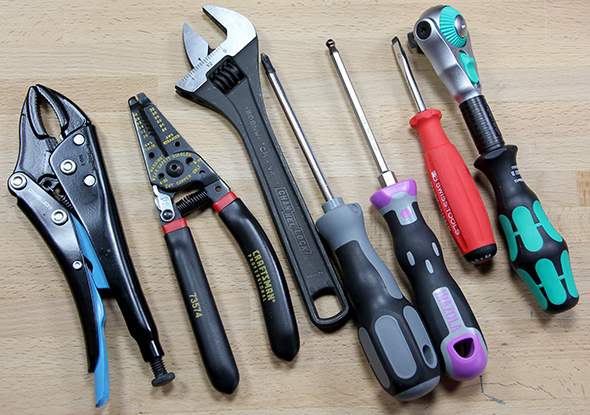 Starlock tools are not backwards compatible, which means you’re stuck with Bosch and Fein accessories, which isn’t a bad thing unless you have a stockpile of accessories that fit other tools. And even if you do, maybe you’re looking to upgrade your corded multi-tool, but not your cordless one. 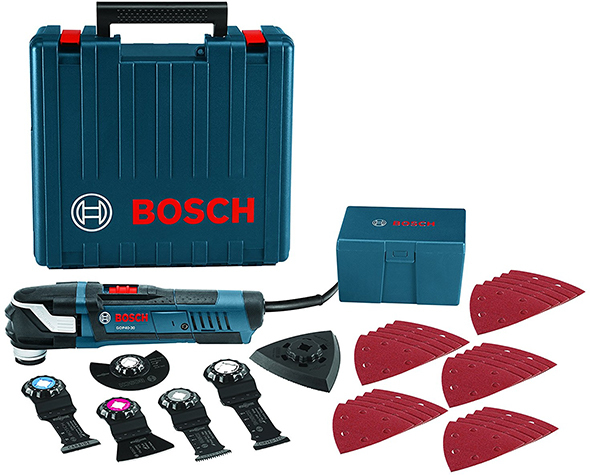 This Bosch Starlock-compatible oscillating multi-tool kit gives you more accessories to start off with. Bosch tools give you greater bang for the buck, Fein has traditionally been a little better in my opinion. I used both Bosch and Fein tools, and haven’t done any direct comparisons. Both are outstanding multi-tools, but the Bosch is a better value. Which to buy? Well, do you prefer blue or orange? You really can’t go wrong either way. Maybe in a few months I’ll have the time to do a head-to-head comparison. But in the meantime, I’d recommend both equally. Hitachi’s 18V triple anvil brushless impact driver has become my favorite cordless impact driver, which is no small feat. They also recently came out with a brushless impact wrench. 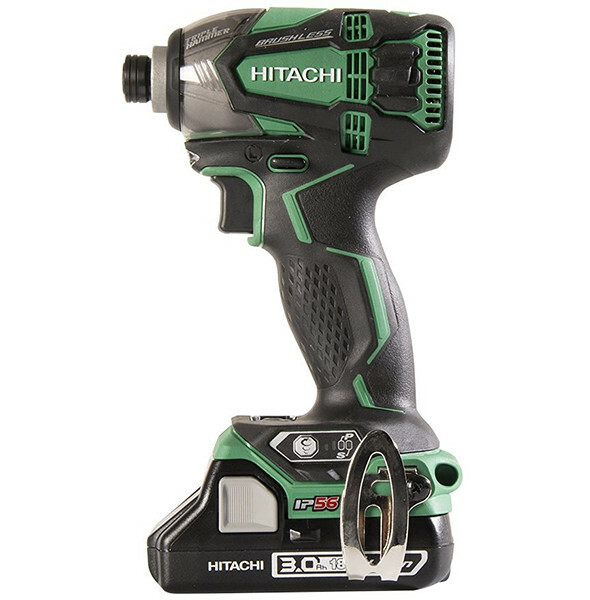 Ben’s review of the Hitachi brushless triple hammer impact driver was published earlier today, in case you missed it. It’s pricey, but powerful, compact, and ergonomic. I love having 4 different speed and operating modes, and independent LED worklight controls. If I had to describe this impact in one word, it’d be smooooooth. It’s still loud, but its loudness is softer than a lot of other impact drivers. It’s a pleasure to use. 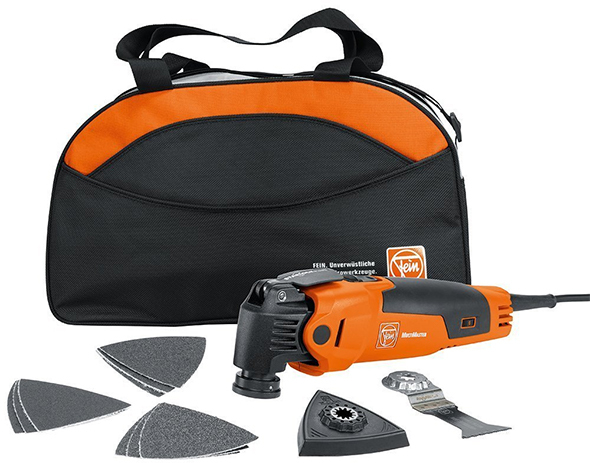 It’s the best impact driver I’ve used, and with a regular price of $400 for the kit, which comes with (2) 3.0Ah compact Li-ion battery packs, it had better be! 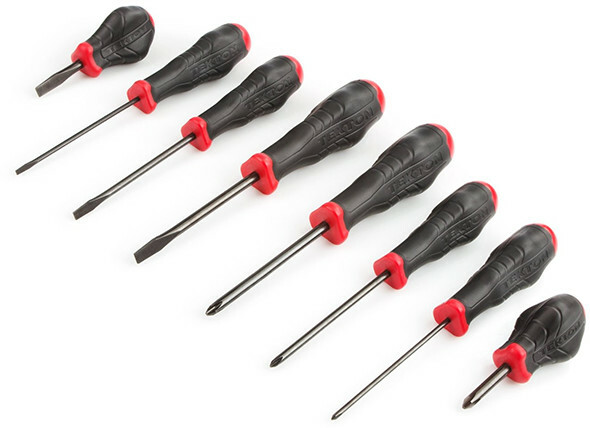 Tekton’s USA-made screwdrivers are great screwdrivers for the money! I don’t like these as much as more premium USA-made and European-made screwdrivers. But it’s hard to argue with the price. Some users won’t love the handle ergonomics, but I find them to be comfortable. Right now, the 10-piece set is most economical. Shown above is the 8-piece set, a still very good bargain. Proto recently came out with new 90-tooth ratchets with 4° swing arcs. There’s a range of sizes and styles (e.g. short, long, flex-head, black oxide, etc.). One just arrived for testing, but I won’t have feedback immediately ready. I can tell you this – if I had to give up my ratchets, my Proto Big Dawgs would be among the last to go. I bought a 3/8″ ratchet in great condition on an enthusiast forum, and asked my father pick up a 1/4″ version from Grainger. They’re simply lovely. The standard length full polish 3/8″ ratchet, J5249HTC, isn’t cheap, but industrial-grade tools rarely are. Here’s Proto’s PDF sales flyer, if you want to learn more fast. I’m working on a hands-on preview, but it’ll be at least a few more days. If I were looking for a new ratchet and wanted USA-made strength and precision, this is probably the one I’d buy. I’d probably wait a little for the price to soften, or for a great discount promo. 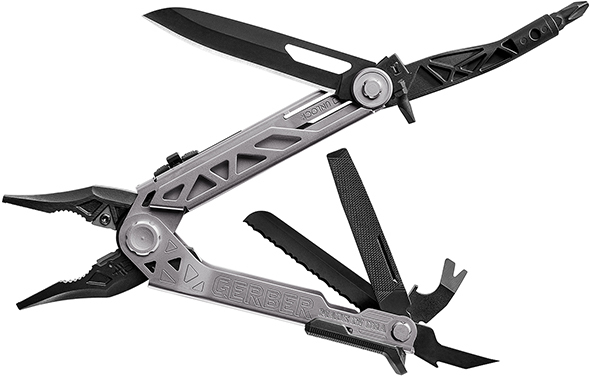 Gerber’s new Center Drive multi-tool features quick-access pliers, a large one-handed-access knife, rotatable and replaceable wire cutting blades, and a full-sized centered screwdriver bit holder. It’s not quite as elegant as the Leatherman OHT multi-tool that I reviewed and continue to use, but it is arguably more functional. The Gerber Center Drive was designed to be better than the Leatherman in every way, and I think it is, but I tend to prefer the OHT better. I think. Personal preferences aside, I think the Center Drive is a fantastic tool. It’s also more jobsite-focused, rather than tactically themed, a big plus in my book. Ryobi came out with an 18V cordless glue gun, and it sells for $30. 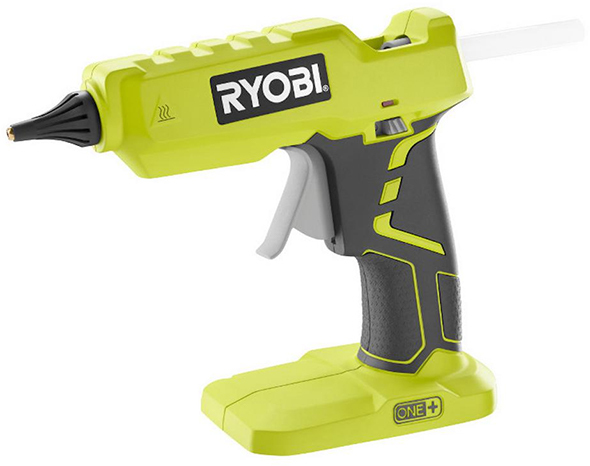 *thumbs up* to Ryobi – this is a great tool for everyone who uses hot glue adhesive, or has been thinking about it. Cordless for the win. I tend to work with a lot of hex fasteners, and upgraded to a few loose PB Swiss hex keys a few years ago. Then I bought a color-coded imperial ball hex set when it first came out. After that, I bought a small set of ball end metric hex keys, like the one shown here. It was the 212LH-5 RB set, to be exact. Last holiday season, I bought some more. PB Swiss hex keys are pricy, but they’re superb. I have yet to run into a problem with them. I’ve had issues with other brands, with hex keys not fitting quality fasteners, getting stuck, deforming, and wearing too quickly. With these PB Swiss hex keys, they fit well, can handle more torque than I should use on a ball hex end. The color coating isn’t indestructible, but holds up well. Wera’s bit ratchet is teeny tiny, but oh so very useful. I bought a Bit-Check, which comes with the ratchet, Rapidaptor bit holder, 28 screwdriver bits, a 1/4″ hex to square drive adapter, and a fantastic compact case. It has been absolutely indispensable over the years. I’ve tried some other tiny bit ratchets, but I like the Wera one the best. You can get just the ratchet for $29. See Also(via KC Tool) – Remember their ToolGuyd 10% coupon! I think a “tool-check” might also be in the cards for me at some point. It comes with the ratchet, Rapidaptor bit holder, screwdriver handle, sockets (imperial or metric), a selection of screwdriver bits, and a larger case. The imperial set is $85 via Amazon, and the metric set is $84. If I were to buy a set these days, I would want to find the same as what I own for $65, or I’d upgrade to the “tool-check” for $85. Or maybe I’d get a smaller one that’s easier to slip into a pocket, but having the bit ratchet, Rapidaptor bit holder extension, and bits in the same case has been mighty convenient. I don’t think my father has ever used the Channellock adjustable wrenches I gave him, or the Irega ones I found at a tool liquidator (Irega makes Channellock’s wrenches as well as their own), but I’d buy them for him again in a heartbeat. They’re strong and comfortable to use. You could get several made-in-China adjustable wrenches for less money, but I consider this a worthy upgrade. Once someone new to laser distance measuring tools stops making *pew* *pew* laser noises, they realize that it’s a great complement to tape measures. They measure over couches, across floors, through rooms, and over distances one couldn’t manage with a tape measure alone. 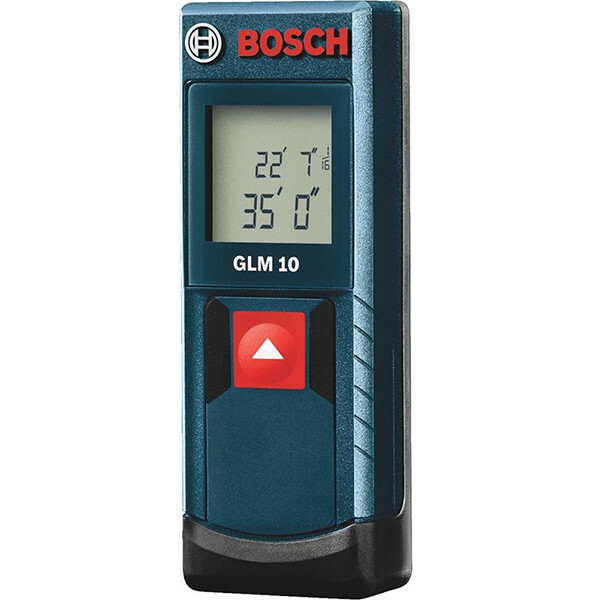 This Bosch GLM 10 is economical priced, easy to use, and accurate. If you want greater range and a backlit display, step up to the GLM 20 for $47-50. 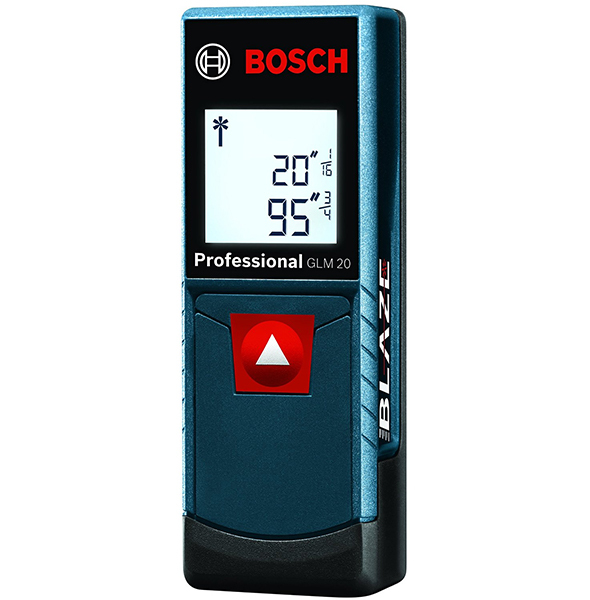 I had the pleasure of using the Bosch GLL 30 self-leveling cross line laser level this weekend. It’s remarkably easy to use, and comes with a small clamp that mates with its 1/4″ tripod socket. 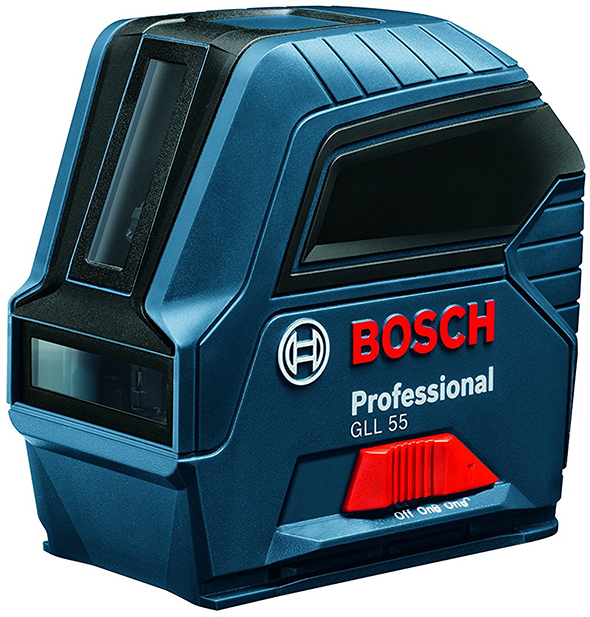 I also had the pleasure to use the Bosch GLL 55 recently, which I found to be more visible on a sunlit wall. 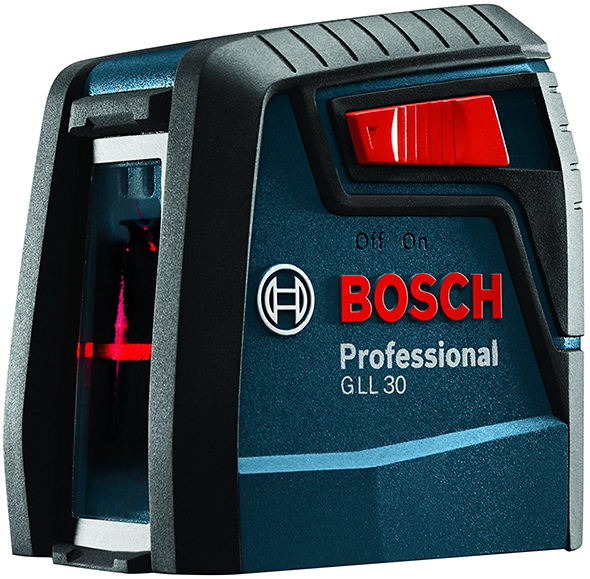 Unless you’re on a tighter budget, the GLL 55 is much more capable than the GLL 30. It has some accessories I don’t need, and lacks the GLL 30’s clamp, but I was able to use some photography accessories to mount it to a pole. I’m sold on Bosch’s cross-line lasers. 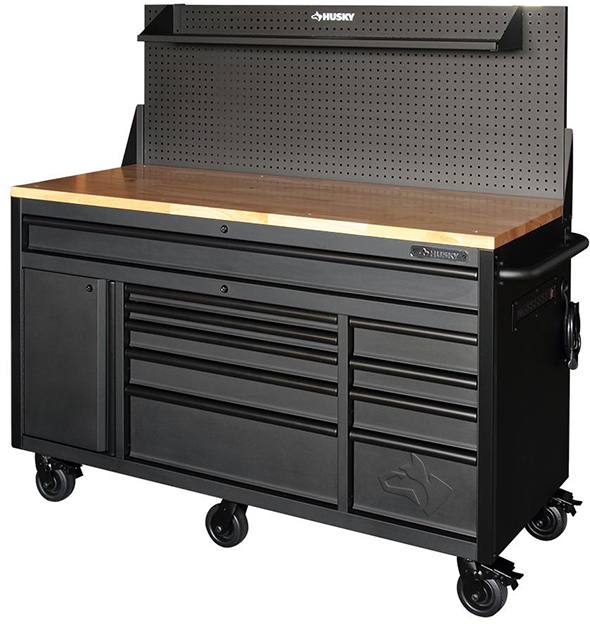 Husky recently came out with a new 60-inch mobile workbench with pegboard backwall. I’ve been testing the other model, which is seemingly identical but with different casters, no backwall, and currently $100 higher priced. I could very enthusiastically recommend the 60″ mobile workbench. And since this version gives you more for less money, I’d say take the added features and ignore them if you don’t need them. The pegboard assembly is removable, in case you want a 2″ shallower depth. With or without that pegboard, the worktop is 24″ deep. Nice! Don’t worry about that huge full-width drawer sagging (or at least I don’t) – there are drawer slides on both sides, plus a third one at the center on the bottom. This way you get anti-sag reinforcement, and extra sliding support. Milwaukee’s version is also on sale for $598. It has slightly less depth and a different configuration, plus different accessories. Which one to buy? The Husky gives you more for the money, but maybe you prefer Milwaukee’s configuration and color scheme. If you can’t decide, I’d throw my vote to the Husky. I’ve been using Dewalt’s 8V Max gyroscopic cordless screwdriver, and it’s a neat helper for light-duty tasks, such as assembling Ikea furniture. I wish I knew where my Dewalt 8V Max pivoting gyroscopic screwdriver test sample was. Like the inline model I previously mentioned, you squeeze the trigger and then turn the handle in the direction you want the fastener to turn. It’s really a great way to control speed and direction, and although I’ve made some mistakes and miscalculations in how hard I’ve turned the driver, things always turned out well. Here’s my review of the Dewalt 8V gyroscopic pivoting handle screwdriver, from the summer of 2013. In addition to the 2-position handle, this model (DCF680) also has an adjustable clutch. I’d say go for the 2-battery kit ($89), and also the Dewalt 8V Max LED flashlight ($22 via Amazon). Not that I don’t like the inline gyroscopic screwdriver, but this version is simply better featured, and I’ve missed those features. 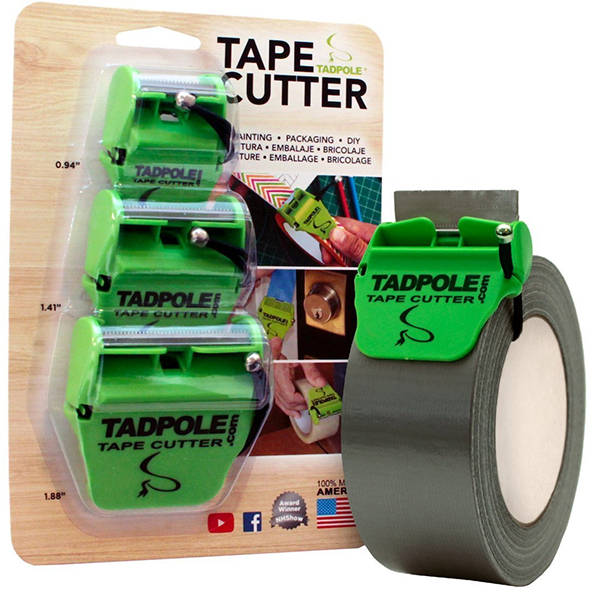 The Tadpole tape cutter is a little strap-on cutter that makes it easier to size tape that comes from dispenser-less rolls. I bought one of each size, and will be reviewing them sometime soon. They’re made in the USA, and what appealed to me is that they’re compact and easy to attach and remove. You could use one for packaging tape one minute, duct tape the next, and then transition seamlessly to masking tape. There are 3 sizes, corresponding to 1″, 1.5″, and 2″ nominally. When I first started writing this post, there was a 3-piece set for $16. I would have recommended that set, and would have bought it too if it had been available when I ordered my 3 sizes separately. It looks to have sold out, and there’s no word as to whether Amazon will stock the value-priced set again. 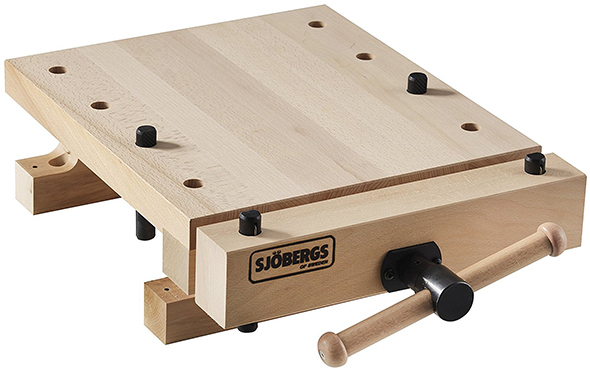 Sjobergs took their Smart Vise portable bench vise, and upgraded it in every way. This new version is made from knot-free European beech. From the images and 50% greater weight, the Sjobergs Smart Workstation Pro vise looks to be a lot sturdier, too. While not inexpensive, this is one of the better ways I’ve seen to get a functional woodworking vise and worktop (albeit a small one) without a lot of time or elbow grease. I haven’t tried it in person, but enough requests can get me to spring for one to check out. If I was very tight on space and time, this would be high up on my wishlist. Aww, look at this cute little guy. It’s a compact knife (1.6″ blade) that also has a carabiner keychain attachment (when closed), pry bar, bottle opener, and screwdriver tip. It’s a small but functional-looking mini blade-centered multi-tool. 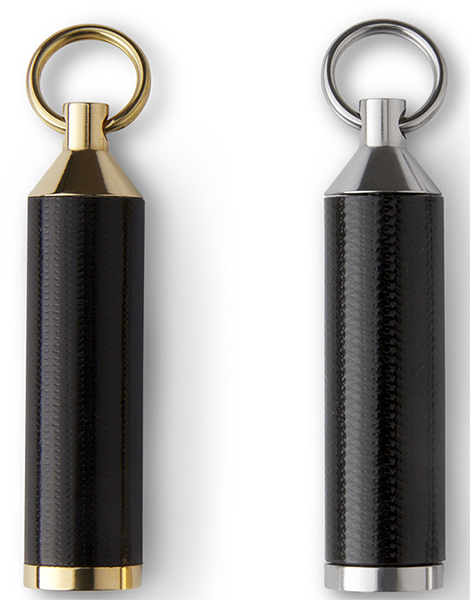 Ooh – there’s a carbon fiber-handled version too, for $20. Before you scoff at the $20 price for these Gearward USA-made compact keychain duct tape holders, I’d encourage you see how much Atwood’s “Roll Bar” sold for ($48). Available in brass or stainless steel, the Gearward duct tape holder keychain holds around 18″ of Gorilla Tape, or 24″ of Gaffer’s tape. this is plenty for lots of “I need some tape, FAST” on-the-go situations. I bought one for review, and consider it a very handy EDC accessory. It’s not an essential piece of gear, but it does make it easier to carry and dispense tape. Some should save the $23 and simply roll some tape around a dowel rod, cut-down pen barrel, or other low-cost core. This little tape holder is the type of product that costs just a little too much to be comfortable about, which makes it a very good gift item. I’d buy this for someone else, and it’s the type of thing I might have wanted as an EDC gift. If you’ve got a good-sized metal lathe and good tooling, you can make this yourself. But I don’t, and I can’t. I’ve been pining for an Atwood roll bar for a long time, but I wouldn’t buy one even if they were available now in plentiful stock. This Gearward doohicky is less elegant in comparison, but it’s perfectly functional, and not in the least bit bad-looking. I saw this Porter Cable Multi-Material circular saw at a nearby Lowes when I went scouting for early Father’s Day deals. It has a 3.5″ blade and comes with different blades for cutting wood, metal, and tile. 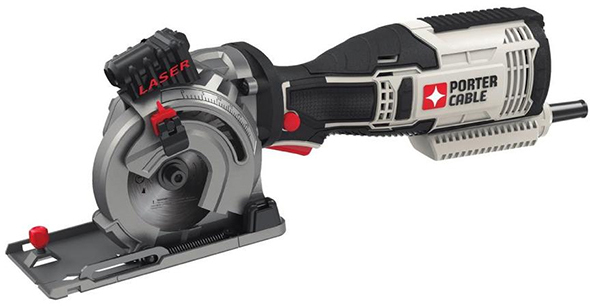 It’s priced at $99, which places it in direct competition with Rockwell’s Versacut and mini circular saw. I like the looks of the design, but the laser indicator has me rolling my eyes a little bit. It’s not the laser indicator by itself – the LASER labeling on the laser housing partially contributed to that eye-roll. The saw also features a pivoting blade guard system, vacuum hose adapter, tool-free depth adjustment (this was highlighted feature on the box), and an ergonomic-looking grip. My biggest concern would be replacement blade availability, something that a Lowes.com reviewer apparently shares in. 3-3/8″ blades are available from a number of brands. 3.5″? Not so much that I can see. Still, this looks like a handy light duty saw to potentially look into. Nice list, but most of it is way too expensive. Except for the tadpole tape thing. Gotta admit that’s cool and hits the “why didn’t I think of that? !” realm. 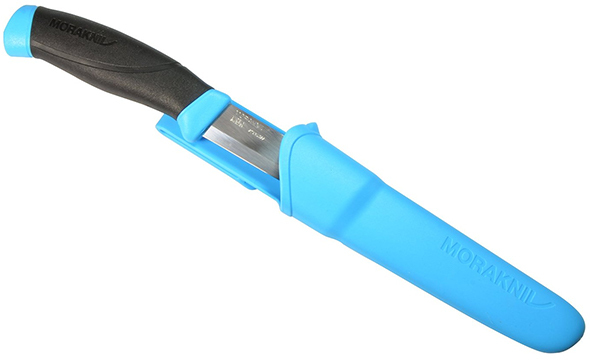 And a Mora knife is always an inexpensive, go-to item as well. The rest is just way too expensive. I’d like to see an under $25/$20/$15 list, you know, something that kinds teens and under could get their Dads. Maybe also stuff that is easy to get like at HD or lowes or walmart. I can try to do this, but it’s not easy to set the target pricing so low. At those prices, there’s a lot of “seasonal” stuff. There are some good tools too, but not a lot I can think of off-hand for a gift guide. 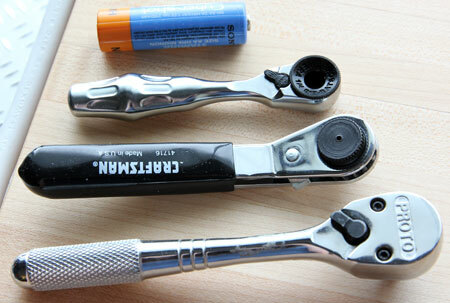 Under $25 stuff is typically a 3 packs of adjustable wrenches or a socket set kit. Pretty much useless stuff only good for the wifes tool bag. Want to give me something for under $25 make it a gift card that I can add another $75 to. I have one of those Kershaw knives. Seen a lot of complaints about getting it to open with just the thumb. After about 3-4 months of use mine now opens easily with just my thumb and while I do not recommend it I can open and CLOSE it with one hand. My kids, now all middle-aged, no longer buy me tools – because I’ve shown them my shops and told them they will need to run the Garage/eBay/Craigslist sale when I’m gone. But tools for Father’s Day sure has its appeal. I assume that this list is for ToolGuy’s who are looking to suggest (hint hint) to their families. In that vein, I agree with John that a more modest price range would be better. So the questions are – what’s new and novel without being gimmicky , will add to Dad’s capabilities or provide greater functionality – and still cost a modest amount. Alternatively – the kids might chip in with Mom to buy Dad something he wants – but is t cheap to buy himself. Mora Knives look to be interesting – I’d add their “Eldris” to a list of ones to look at in the relatively inexpensive category. I love those pliers wrenches. Flat jaws so no damage to the nut. I was checking them out at a tool show recently and the rep handed me the smallest pair and said “take a grip on the edge of this with the pliers” (a biggish piece of 1/4″ flat steel) “and just hold on”. He then proved that he couldn’t pull the plate out of the jaws even when I was leaning hard back against the pull. Again, they’re just expensive enough to be really welcome as a gift. BTW – The smallest on is just 5″ ! Like the small Knipex Cobra pliers – 87 01 125 , they come in handy for pliers that are only 5 inches long. I love this list. Thanks for finally doing another gift guide. I would suggest the kershaw cryo or even the cryo II. My cryo 2 is a EDC for me as a general contractor. I have used it to cut romex, drywall, pry off trim, it has been indestructible and takes a huge beating. Best thing about kershaw is they will send you new assist springs if it should break and even screws of one happens to fall out. I especially like your selections on the cheaper spectrum. I have the Ryobi glue gun, and I love it! I recently saw a video of someone using the Ryobi Glue gun for template making. He compared it to the 3M corded gun that we regularly used. While the Ryobi didn’t quite keep up with the 3M’s glue flow – it was probably in the acceptable range. The 3M gun sells for something like $170. The Ryobi sells for $30 – add a charger $40 and 2 high capacity batteries $100 – and you have cut the cord for the same cost. I am looking to purchase an entry level cordless drill for around $100. 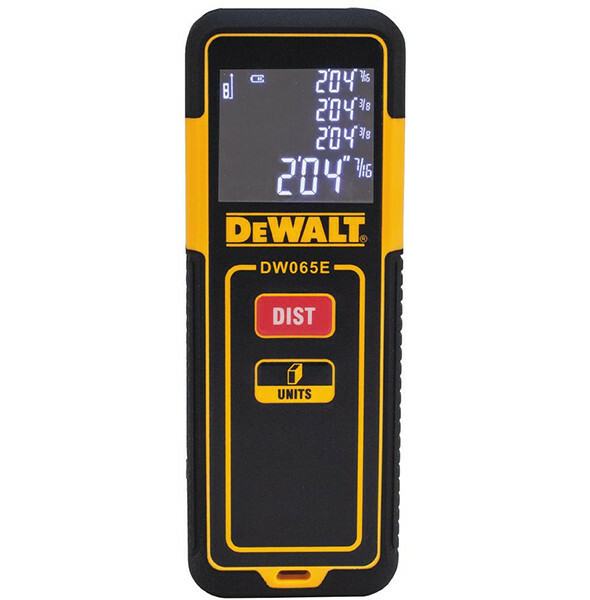 I am leaning towards the brushless DeWalt DCD777, because it seems to be getting great reviews, and it also comes with a second battery. I was also considering this Milwaukee (http://www.homedepot.com/p/Milwaukee-M18-18-Volt-Lithium-Ion-Cordless-1-2-in-Compact-Drill-Worklight-Kit-1-Battery-2606-21L/207132461) for $99, or this Makita (http://www.homedepot.com/p/Makita-18-Volt-LXT-Lithium-Ion-1-2-in-Cordless-Hammer-Driver-Drill-Kit-XPH102/207005162) for $119. However, both of these only come with 1 battery, although at least the Makita seems to be a high-capacity model. 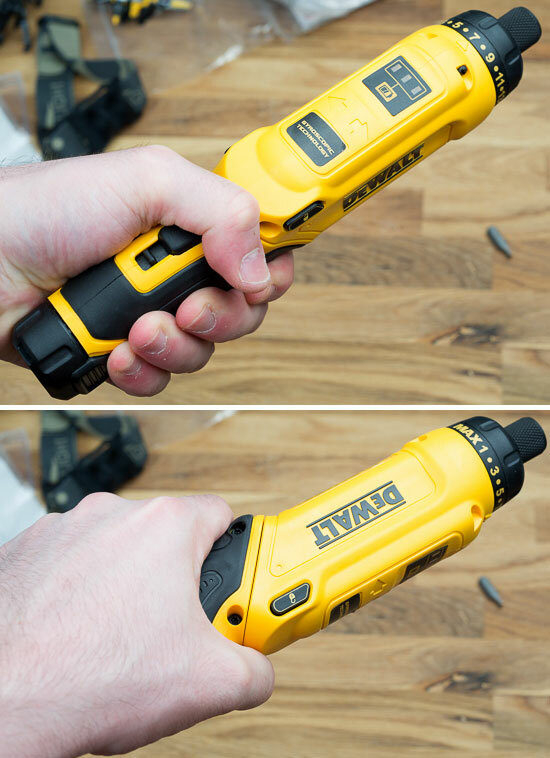 From what I can find online, it seems like both of these have slightly better performance over the DeWalt, although it’s not a huge difference. What would you recommend? I’ll be using it mainly for DIY stuff, no pro jobs or anything. It depends. Which cordless platform do you see yourself potentially buying more tools from? I bought a similar Milwaukee kit for my father a year or two ago, but that was just the single-battery drill kit without an LED flashlight. The Makita kit is an entry-level kit that I would guess will likely drop back to its holiday season price of $99. I don’t need or want hammer drill functionality in a compact cordless drill. Or a high capacity battery pack. I’d favor the Milwaukee kit to the Dewalt. 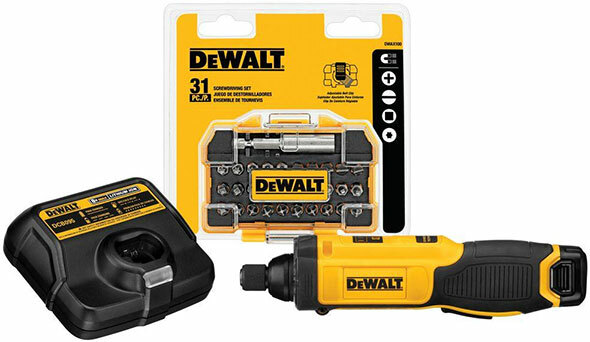 Dewalt: a mass market model that has a brushless motor and is more compact than their previous 18V and 20V Max mass market models, and also with better specs. It has 2 batteries, which are greater than 1. Milwaukee: a regular model in mass market kit configuration with a single battery pack. It’s a tough call. I’m pretty on the fence between recommending the Dewalt and the Milwaukee. I recently ordered the Dewalt kit for someone as part of a new homeowner tool kit package. The Milwaukee kit was not $99 at that time. What would I buy now for my new homeowner friends? Probably the Dewalt. Having 2 batteries to start off with is very handy. It gives you the ability to buy another tool and put it to use right away. The compact battery packs aren’t ideal for use in certain tools, but they’re a lot better than having to shell out for more batteries right away. Unless I learn or come up with a good reason, I think the Dewalt kit has a slight edge. This is based on generalizations. Armed with more information and usage assumptions, my impression might change enough to swing in the other direction. I’m not so sure about the weeny DeWalt screwdrivers. They seem so weeny, and for not much more money you can get the 20V 777. That Kershaw Pub knife (why is it called “Pub”) looks cool, but it can’t really stay on a keychain, because opening it makes the keychain loop fold back into the handle. Also, sometimes you really need a knife with a point. Instead, I might consider an engraved Victorinox Classic with Inox or sterling silver scales. Alternatvely, I would also suggest at an Opinel knife with some fancy rosewood or ebony handle, instead of the usual birch. Beautiful, simple, a little crude, but very likely to become a daily companion. And with an ebony handle, way too expensive and impractical for somebody to buy for themselves. (sigh). There is an even more expensive version with a buffalo horn handle. Those little Victorinox folders are great stocking stuffers too. Some charities (like Wounded Warriors) were using them (with their logos) as promotional give-aways. $15 for metric and inch combined set. If dad has a bunch of loose assorted wrenches this is a step up. I use these and like them. Of course not pb Swiss quality but better than other basic brands. In general I find tekton to be a great budget buy for many tools. Bondhus USA made hex keys are also great ideas and don’t cost that much more. I’ve had trouble with recent coated Bondhus keys, but it seems to be a fluke occurrence.